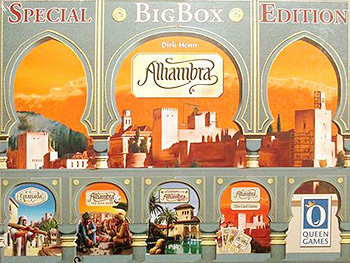 Four independent games of the Alhambra universe. Contents: 6 Starting tiles, 6 Scoring markers, 1 black marker, 2 summary tableaux for scoring, 108 money cards of four currencies, 54 building tiles, 2 scoring cards, 1 linen bag, 6 "+100" markers. Contents: 1 Game board (two-sided), 8 white dice and 1 black die, 26 bonus tokens, 1 starting player token, 1 octagonal Caliph stone, 30 octagonal marker stones, 6 counter stones, 36 building stones, extra tower tile, 1 leather dice cup.